I still haven’t posted any pieces other than 005, so as a beginning I uploaded an OGG of 017. I like how the ending turned out. For those of you who do not yet enjoy the wonders of open source as much as I do: look for the file with a .mp3 extension. cube.garron.us finally has an index page. By the way, I solved a Square-1 blindfolded yesterday; I get to be at the top of speedcubing.com (notice their news coloring scheme; it gave me the idea for this page). Oh, and if anybody knows a bit about graph theory, I would love to know to find the smallest set of Square-1 shapes such that a member can be reached in one twist from any position (you can find my email somewhere on the Unofficial World Records pages). Created a history for my 3x3x3 methods. I also started my algorithm page. 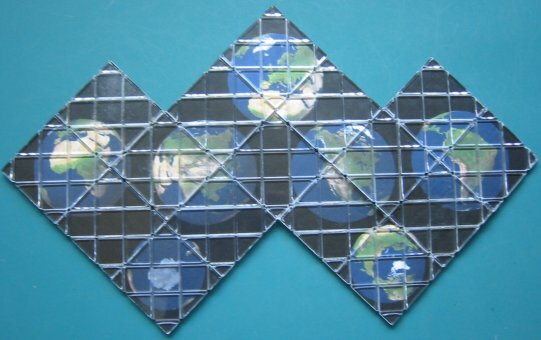 I created new Super Magic pattern with world views from space. It looks nice: Front Back. Puzzle videos now have their own page. I put up a page with my puzzle records.